diy Wu-Shaknov Experiment: Cheapest Demonstration of Quantum Entanglement? George Musser – an editor at Scientific American (and author of “The Complete Idiot’s Guide to String Theory”) – developed a diy version of the Wu-Shaknov Experiment. If George’s setup truly manages to measure the relative linear polarization of gamma rays from positron-electron annihilation, then he would have accomplished the most inexpensive demonstration of quantum entanglement! The idea is to measure the relative linear polarization of gamma-ray photons emitted with opposite parity from the annihilation of positrons produced by the decay of Na-22 using Compton polarimetry and coincidence counting. The predicted results in the number of coincidences are different when assuming quantum entanglement than when basing the calculations on local hidden variables theories. 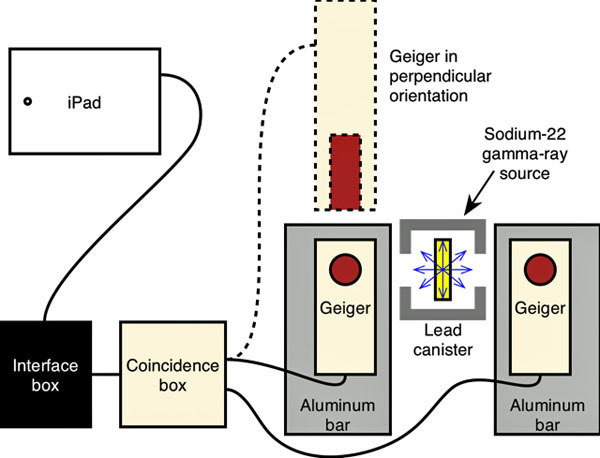 George uses an exempt Na-22 source and two Geiger counters connected to a coincidence counter. His results are not spectacular from the point of view of statistical significance, but they do seem to be consistent with what Compton-polarimetry theory predicts for entangled photons. Excellent work George! This setup is orders of magnitude cheaper than an entangler based on downconversion with a BBO crystal and detection with SPCMs. We are really interested in the follow-up discussion and comments on these experiments! Click here for part 1 of George’s blog on his diy Wu-Shaknov Experiment. Click here for part 2 of George’s blog on his diy Wu-Shaknov Experiment. What about using your modified CDV700 with an scintillation probe? I guess if not already trying you are tempted to do this.